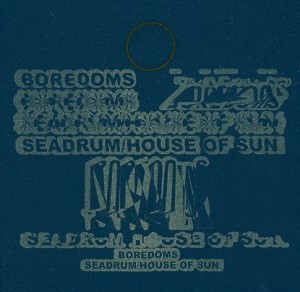 The Boredoms - "Seadrum/House of Sun"
After two albums of tribal Krautrock/Space Rock grooves and then nearly 3 years of silence, Japan's The Boredoms return with yet another re-invention of their sound. This time, you'd be hard pressed to even call them a rock band. Indeed, the first of just two 20+ minute cuts on the album, Seadrum begins with over a minute of warbling, jazzy female vocals before launching into an intense, complex freakout of percussion. Eventually, wild cascades of Sun Ra like piano crash through the mix as well, with spacey gospel like female vocals chanting long mellow ahhhs. This song does truly live up to its name. With great whooshing rolls colored with an infinite sparkle of musical notes, and unrelenting rhythms, this effectively conjures up the beauty and chaos of the sea. The second track takes an entirely different approach. Reminiscent of some of the Acid Mothers Temple's more esoteric, contemplative eastern excursions, House of Sun is an extended meditation of droning tanpura, shimmering sitar, and melodic guitar. In fact, there is something quite spiritual about this album, whether it be from the breathless wonder of creation experienced through Seadrum to the inward reflection of House of Sun, this is an album that takes the listener right along with it on its journey of discovery. Unfortunately, there is no documentation with the CD, and the only web site I can find that may have some information on it is the Warner Music Japan website at: http://wmg.jp. But it is, of course, in Japanese. There's also a fan created web site here, though it is somewhat out of date: http://www.boredoms.co.uk.